Course Website: Official Website - Visit Southern Highlands Golf Club's official website by clicking on the link provided. Accolades: Ranked 6th in Nevada on Golf Course Gurus' Best in State list. 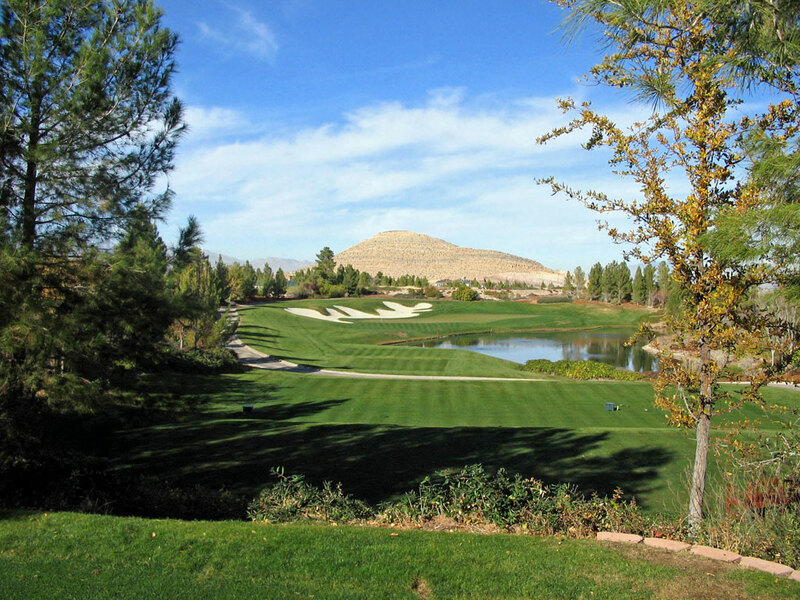 What to Expect: Southern Highlands is one of only four courses that can make the impressive claim of being a co-designed golf course by Robert Trent Jones Sr. and Jr. The course is found within the luxury Southern Highlands community just off I-15 a few miles south of downtown Las Vegas. The most distinguishing feature of the Southern Highlands golf course is the unique bunkering molds that look like a series of ink blots scattered throughout the track and delivers an artistic slant to each hole. In typical Vegas fashion, the course delivers some fluff with waterfalls featured on a few holes, but the architectural merits of the course go well beyond the fluff. The bunkering is peppered near the landing areas of most of the holes and require the golfer to stay focused on each shot and strategy they choose to employ throughout the round. Several elevation changes also are featured throughout the rolling terrain with the largest change being from the tee box of the 500 yard par four 11th hole down to the bunkerless fairway. 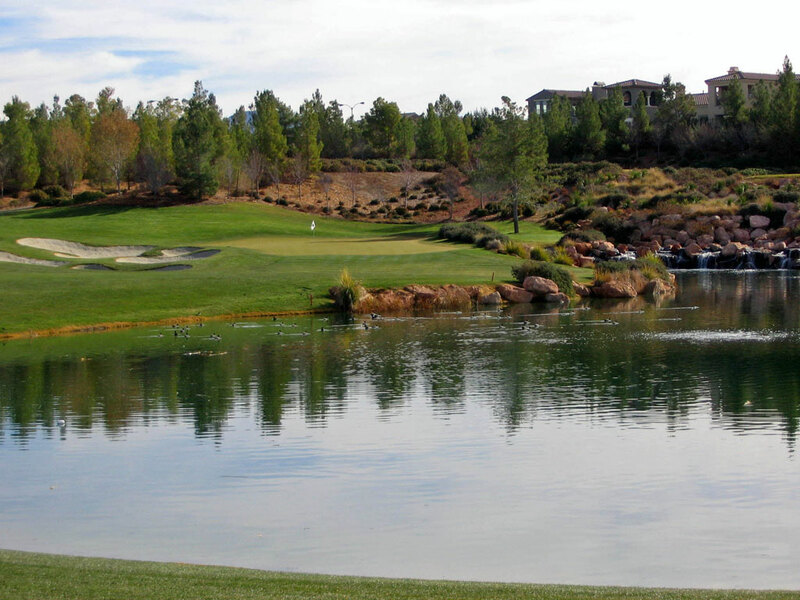 Southern Highlands is a wonderful and challenging golf course that is a favorite in Vegas. 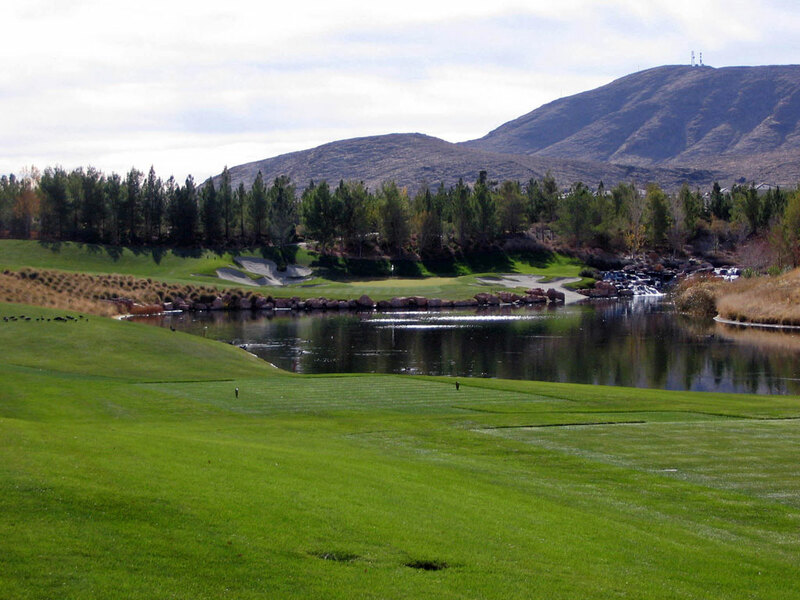 Signature Hole: 18th Hole – 622 Yard Par 5 – Southern Highlands' finishing hole is not one you will soon forget. Measuring out over 600 yards, this dramatic par five plays uphill with a dual fairway that is split by a tumbling rocky creek. The risky and potentially more rewarding option is to challenge the more challenging left side which will shorten the hole and open up a better shot into the green. The safer right side offers more fairway to play in but a potentially blind shot into the putting surface. With the impressive clubhouse and mountains acting as a backdrop, this is a hole you won't soon forget. Best Par 4: 16th Hole – 423 Yards – Options; the key to any great hole and the element that makes it interesting over and over again. On the 16th hole the golfer is presented with split fairway where a smaller landing area is offered up the left side after carrying the waste area and a larger fairway is presented up the right. A short and relatively easy approach is offered from the left fairway while the approach from the right brings a bunker and inferior angle to the green into play. The choice is yours and your decision on how to play it may vary depending on what game showed up for you. Best Par 5: 3rd Hole – 620 Yards – Featuring an elevated tee, this dogleg left hole features a large bunker complex on the inside corner and a longer, skinnier bunker on the far side of the fairway. After the tee shot players are confronted by a large pond that fronts the green and wraps around the right side. There is no margin for error when trying to reach the green in two unless players can start the ball out left of the green and fade it in towards the hole thus keeping it over land the entire time. Alternatively players can layup to the fairway left of the water before wedging their third shot onto the putting surface. With a lot of hazards and options, the 3rd at Southern Highlands is a great par five to play early in the round. Birdie Time: 5th Hole – 365 Yard Par 4 – While the scorecard reads 365 yards, a 250 yard carry straight at the flag will clear the water hazard and likely leave you with an eagle putt. For the less daring, less than driver is needed while players take aim at the large bunker complex up the left side of the hole. Once arriving in the fairway short of the sand, a nice wedge shot into the green will leave the safe player with a birdie putt and a great chance of taking a stroke back from old man par. Bogey Beware: 10th Hole – 455 Yard Par 4 – While the impressive 11th hole with its expansive views measures 45 yards longer, the 11th plays well downhill while the 10th climbs uphill at a challenging pace. Fairway bunkers protect each side of the driving zone and the uphill lies in the fairway often deceive golfers into taking less club then they need to reach the green. 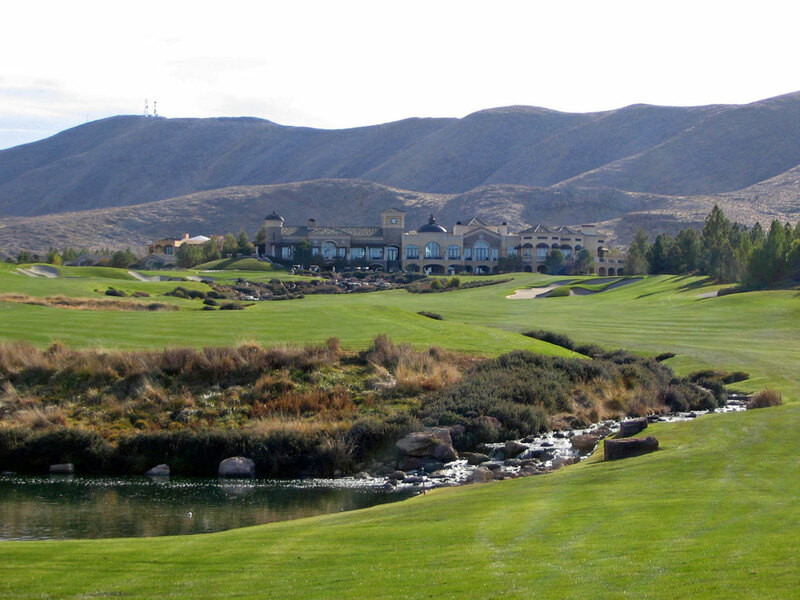 With two of the hardest holes on the course back-to-back, the second nine at Southern Highlands starts off as stout as any course youâ€™ll play.